If you're anything like me, you enjoy reading and participating in book clubs. I belong to two local book groups and have tried to participate in a variety of online book groups of the years. Regrettably the online book group participation has never seemed to work out due to time constraints, etc. Well, author Melissa Ford is offering something a little different. The GRAB(ook) Club has each member post one question related to the book of the month, the June book is Ms. Ford's Measure of Love, and then club members hop from one blog to another, reading and answering questions. Do you have any serious regrets about any of your past breakups? If so and you're single/divorced/widowed, etc., do you wish that you could start again with that ex? Please post your response by commenting. After you answer my question, please click over to read the rest of the book club questions for Measure of Love (http://www.stirrup-queens.com/2013/06/grabook-club-discusses-measure-of-love/). 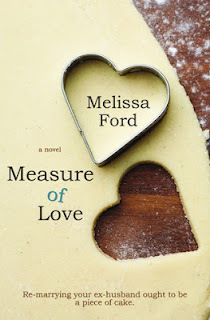 You can get your own copy of Measure of Love by Melissa Ford at bookstores including Amazon (http://www.amazon.com/Measure-of-Love-ebook/dp/B00C7Y1Y8E/). I also really enjoyed Life from Scratch and Measure of Love! As for your question, yes, I do have some regrets about past break ups and even those who asked me out that I said no to and later wished I had given them a chance. BUT, and it's a big but, I have been happily married, with somewhat normal relationships challenges along the way, for almost 13 years now and wouldn't trade that for a "redo." Will I always wonder about certain guys that got away? Probably. And now and then I do allow myself to day dream about parallel lives, but I realize in doing so I would have to give up what I have now (my husband and children), which I will not do. I feel grateful for the wonderful partnership/friendship/marriage that I have with my husband and choose to focus on that. However, reading books like Measure of Love certain makes me think a lot about what makes relationships work (especially non-marital ones), which has been very interesting. I have no regrets about past break ups - other than the idea that I should probably have done it sooner in several cases. Looking back I don't actually regret any of the breakups I had before I was married. I do regret the breakup of my marriage but realize it happened for a number of good reasons. Both my ex and I have been able to move forward with our lives and I can't actually see us ever getting back together. I'm glad to say that I've learned from all of my past relationships and grateful for those lessons...wouldn't want to repeat them but still appreciate the knowledge gained. I second what areyoukiddingme said, that some breakups could have been done earlier. There's one though that I think would have been worth fighting for a bit longer, but in the end I don't think the outcome would have been different. Now, I'm married and it feels right. So no, no regrets here. I had one serious boyfriend before dh, & a bunch of short-term boyfriends before that. I was totally smitten, and I wanted more of a relationship than he could offer. He was a student in a very intensive program and spent most of his time working on projects; I was something of an afterthought. Had we ever gotten married, I am sure that would have remained the case -- long days & nights at the office, etc. He was a very nice guy (& very good looking, lol) & I was brokenhearted when we broke up (and I'm still a little bitter that he wound up marrying my next-door dorm neighbour...!) but I truly think it was for the best that we parted when we did. Ooohhh, what a juicy question! Love it! I have been happily involved in my current relationship for 14 years now (7 of those married). However, I definitely do have questions and "what ifs" about other guys, even though, like the others, I wouldn't trade my current life for an alternate one.